Auto wreckers and parts dealers have been Edmonton fixtures since soon after the first car first appeared on its streets. Early car owners were often their own mechanics, since there were few of that trade in business prior to the Second World War. Even then, most mechanics were associated with automobile dealerships, and would usually service only what their company sold. The need for wreckers and parts businesses increased greatly with the return of prosperity following the Second World War, the advent of the oil boom in 1947, and the demand among suburban dwellers for more cars and services. 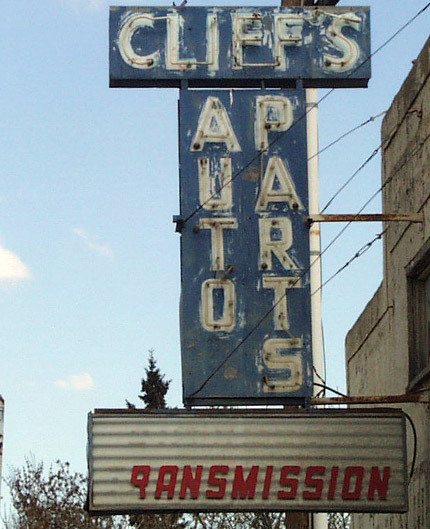 Cliff's Auto Parts and Wreckers operated at 9646 Jasper Avenue from 1959 until 1962. William Choma was the proprietor, while Phillip Fath was the manager. In 1962 Cliff's Transmission and Auto Parts moved to 10819B 101 Street. Cliff's Auto Parts also had a yard located in Riverdale by about 1963. Cliff's Transmission and Auto Parts moved again in 1967, to 10635 95 Street, and continued in operation until at least 1976.